What’s the secret to getting the most out of your landscaping? Start planning early. During a build or renovation, landscaping is often an afterthought, but this limits what you can do with your outdoor space and can also increase the cost of elements such as drainage and fixed structures, which are far easier to install during construction. When building or renovating your home, there is a lot to think about and it makes sense that you may want to put landscaping on the back-burner. But while there is a lot we can achieve after a build or renovation, you will get the best design results when your landscaping is integrated into your initial planning. By consulting a professional landscaper before finalising your building plans, we can help you realise the full potential of your outdoor area and offer suggestions on how to maximise your use of the space. The process is often far more complex than you may have anticipated, but with good planning you can achieve outdoor bliss. The nature of these requirements also means that when your landscaping is integrated with the construction process, your budget will go further. From indoor courtyards to striking entrance gardens and enhanced natural views, these seven spaces show you what’s possible when you plan your indoor and outdoor spaces in unison. Concrete House by Auhaus Architecture. Image via desire to inspire. Every garden has requirements such as drainage, soil quality and access to taps and power points. It is far easier to have these issues addressed during construction rather than calling in tradespeople again when you are ready to install your outdoor area. This is especially important in small spaces such as this one, where restricted access can be a costly challenge to address after a building project is complete. Integrated indoor/outdoor living is a great way to enjoy your leisure time at home and fully reap the benefits of increased contact with nature. To achieve a space such as this, planning must be done before construction, as courtyards can pose the greatest logistical challenges in terms of access (especially if you are planning a feature such as the plunge pool pictured above). In this space, the indoor area integrates seamlessly with the outdoor space, with details such as level flooring, material selection and the open kitchen all adding to the cohesive flow between the two spaces. At the planning stage, order materials for indoor and outdoor spaces at the same time. This is cheaper and will ensure there are no discrepancies in colour and patterning, as your materials such as tiles will be coming from the same batch. This home is a clever example of what can be achieved even when outdoor space is limited. By planning the vertical garden at the same time as the rest of the home, the designers were able to integrate floor-to-ceiling windows into the kitchen to maximise natural light and provide an eye-catching view out to the garden. 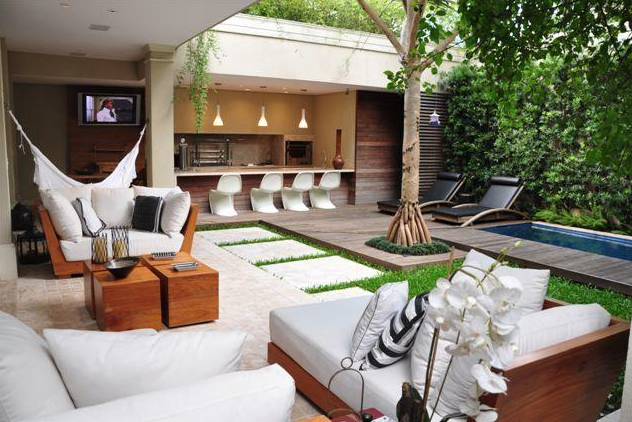 So even though the overall outdoor area is limited, the occupants are still making the most of the space. On a practical level, allowing more natural light into the home will reduce the lighting costs for the home, while vertical gardens such as this one are great for absorbing noise from the city or neighbours. A habitable rooftop garden or green roof needs to be designed in the planning stage of a build or renovation, as these spaces have a number of extra considerations including structural support and waterproofing. You will also need to understand how much weight your rooftop can accommodate and if your plans need to be submitted to council, it is easiest to have this done at the same time as the rest of your building approvals. Have you considered an internal courtyard? When outdoor space is limited, an internal courtyard becomes a relaxing central living hub. They are also an ideal solution for allowing more natural light into your home and increasing your exposure to nature. To get the planning of an internal courtyard right, you need to consider any overhead voids, planting and drainage. These spaces add value and impact, and can also make your home more energy efficient by allowing more natural light inside. Design by Progetto Arquitetura & Interiores. Image via design-milk. This striking entrance is a great example of a challenging outdoor space. Not only do entrance gardens have practical elements such as driveways and paths that need to be considered, but this landscape design also had to overcome the challenges of an uneven site. When a space needs to be built up, it’s not always possible to incorporate a lot of greenery and this home is a great example of alternatives such as water features, which still foster a sense of connection with the outdoors. Even in a small space, it is possible to enjoy your own private pool. Accessing small spaces to install a plunge pool and the necessary drainage can be difficult and should be planned prior to construction. In this space, the pool has been cleverly raised, which limits excavation costs and makes installation easier. Similar considerations should be made for ponds or large water features. Explore 45 pages of garden design ideas by downloading your free ebook, Small Spaces, Big Ideas.